Another locomotive people are eager to criticize, but haven't visited is the end of steam queen, CNR 6218, in Fort Erie, Ontario. I had been told 6218 was a wreck and only a rusted mass. THis is a gross over-statement. The Northern his issues that need immediate addressing, but she is still in a fair state to get that attention. Her cab needs some further weather proofing to keep water out. The wood lining shows mildew damage. Her gauges are in the usual condition, without glass, but most are present. 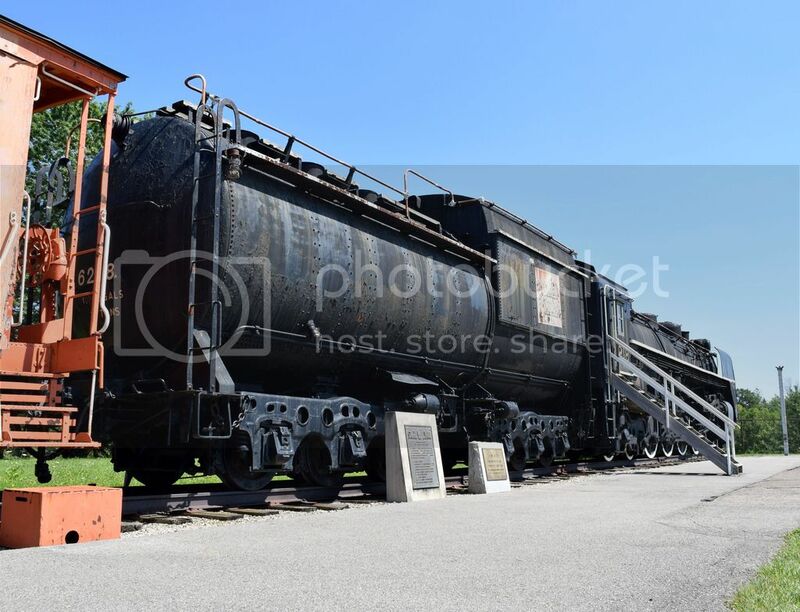 The locomotive is not protected with a fence, so the smell of urine is present. 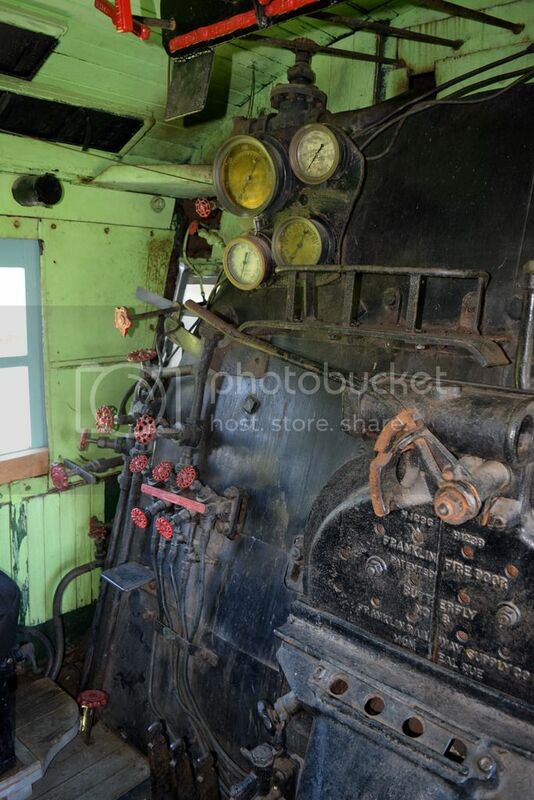 This loco needs to be scraped and painted. 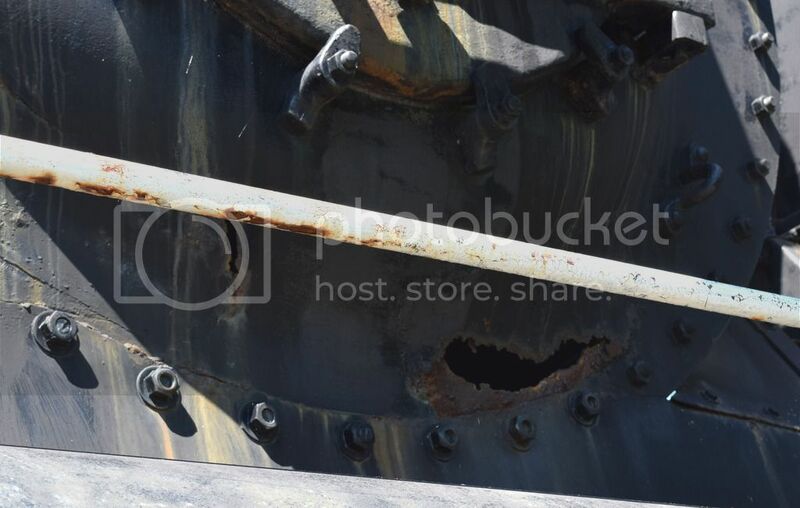 The worst damage is the bottom of the smokebox face, which has daylight coming through. An earlier patch by CNR shops is apparent, and this was a common problem in the steam era. I doubt her stack is capped. The roof, promised when she was first placed, never materialized. 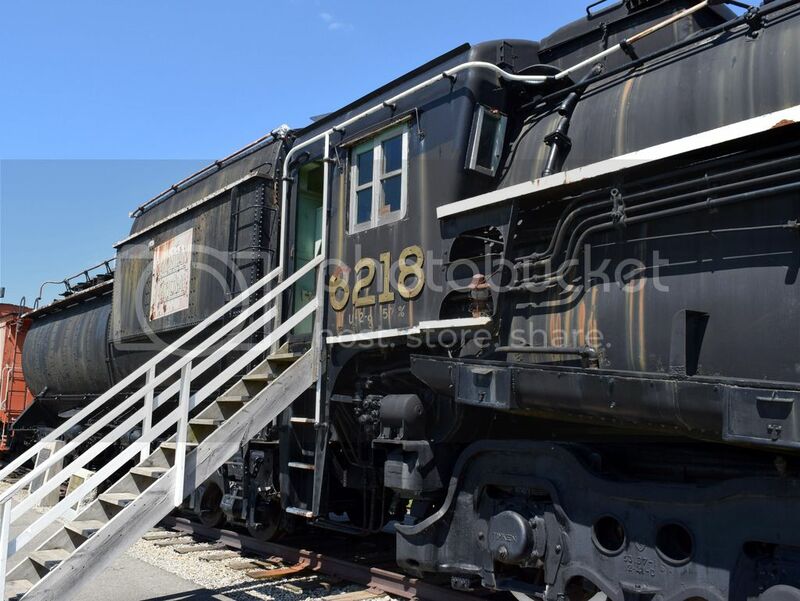 She could be pulled out for restoration, but the locomotive, a caboose and two buildings are the Ft. Erie Railroad Museum. I should add, the caboose is a traditional, wood sided hack. 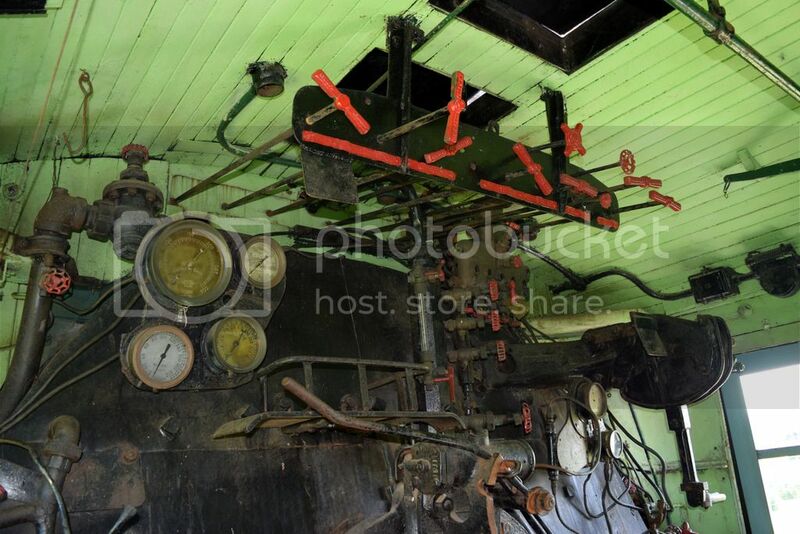 The interior is excellent - the exterior needs a qualified carpenter and some railroad historians to direct the repair. A locked fence, a roof, paint, oil and grease would do 6218 well. 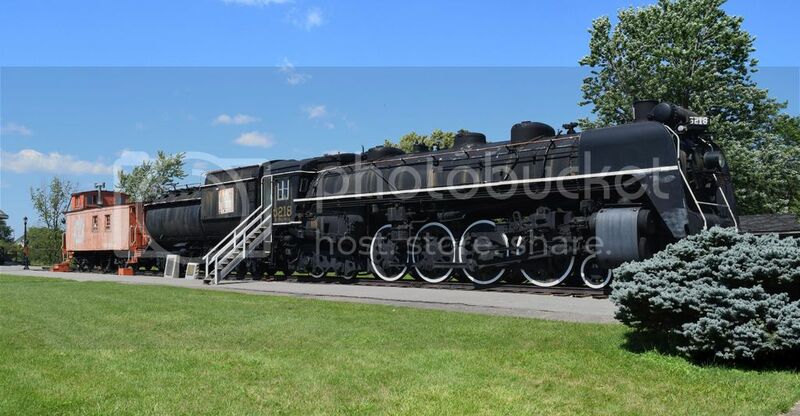 Of all the U class CNR 4-8-4's, she is in the most need of help. Either something will happen, or nothing will happen. It's entirely up to the City of Fort Erie people. I hear there are discussions about what to do with 6218, but that could result in anything along the continuum of nothing at all to moving her elsewhere. People have made efforts in the past to try and get something done with that engine, but the City has been the major obstacle. Among other things, I think they are opposed to allowing volunteers to work on it, but then again, they don't have the money to pay for work to be done to it. I'd take that rusted piece of junk (???) over most park locomotives that I've seen any day ! As you said a good coat of paint and a secure shelter would do wonders for the old girl ! Nothing does more for these park queens than to have a roof over her and a fence around her. Fall 1969: I was an 18 year old co-op engineering student at General Motors Institute, Flint, Michigan. I rode the GTW/CN train to Toronto, stayed in a flea bag motel room, and rode behind the 6218 to Stratford, Paris Jct.(?) and then highballed back to Toronto. I stood in the baggage car looking through the end door at the rear of that vanderbilt tender tank. We were going about 80 mph and the tank was rocking one way as the baggage car rocked the other way. What a thrill..............and the real Col. Harlan (KFC) Sanders rode the truss rod business car. He was frail, even then. Have found this long-running thread most interesting. I had the good luck to be trackside next to the John St. roundhouse back in late summer of 1965. Shows 6218 accelerating W.B. out of Toronto's Union Station on a fan trip. Over the years I'd forgotten the actual date or the occasion...but thanks to RYPN...the blanks have been filled in. I sent a copy of the PDF report by the professionals who inspected 6218, to on of the moderators for posting to this site, but it's 60 pages with images. The report was sent to me after I wrote the City Counsel and Museum staff with recommendations to preserve the exhibit. 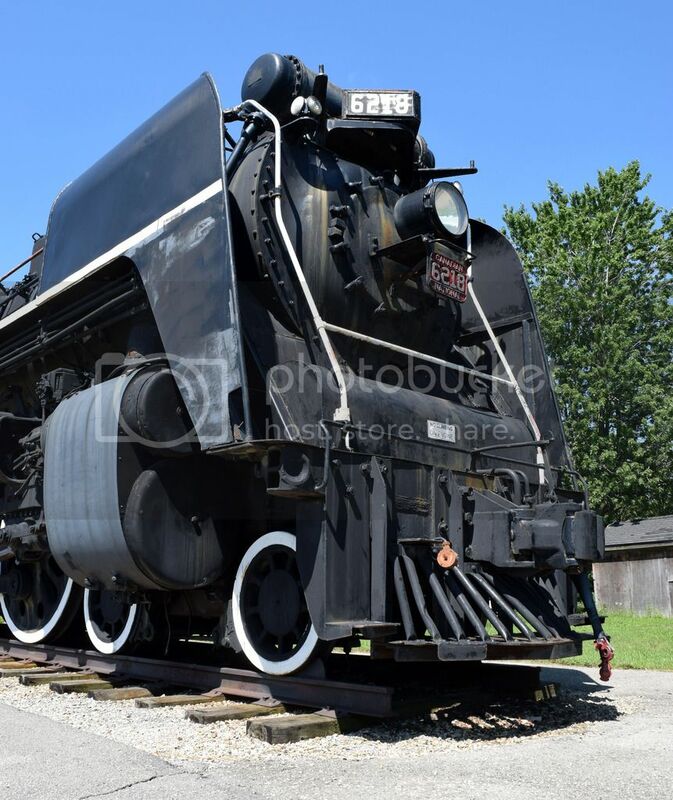 My recs for the locomotive were consistent with this report, including having the smokebox closed and the proper steel welded in to replace the rusted. A roof is also recommended. If somebody knows how to repost the report, I will send a copy by email. It would have been the Spadina Avenue roundhouse, not John Street. They were next door to each other, but Spadina was CN and John Street was CP. I was 14 at the time and my brother and I were on that trip. 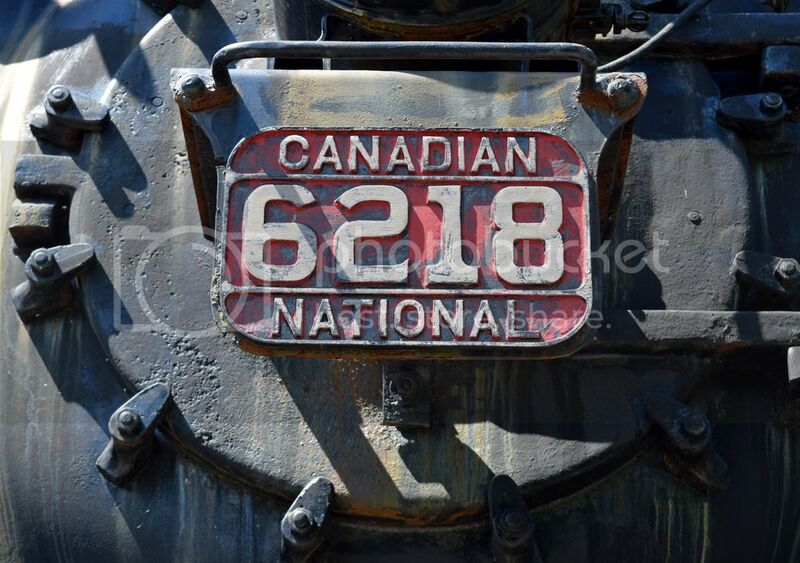 Somewhere I have a slide of the Colonel in the cab of 6218 talking to the crew in Hamilton while they stopped for water and to pick up passengers, he had moved to Canada during that period. Sanders was a boomer railroader, hostler, fireman so he had a genuine interest in talking to his fellow rails I suggest a reading of his life on Wikipedia; a colourful character whose life would make a good documentary or drama. I recall many fast trips, particularly when the excursions ran late and they were trying to make connections in Toronto. Once they hit the Oakville Sub., a non-stop, high-speed run was made back to Union Station with speeds clocked routinely in the 90 MPH range. 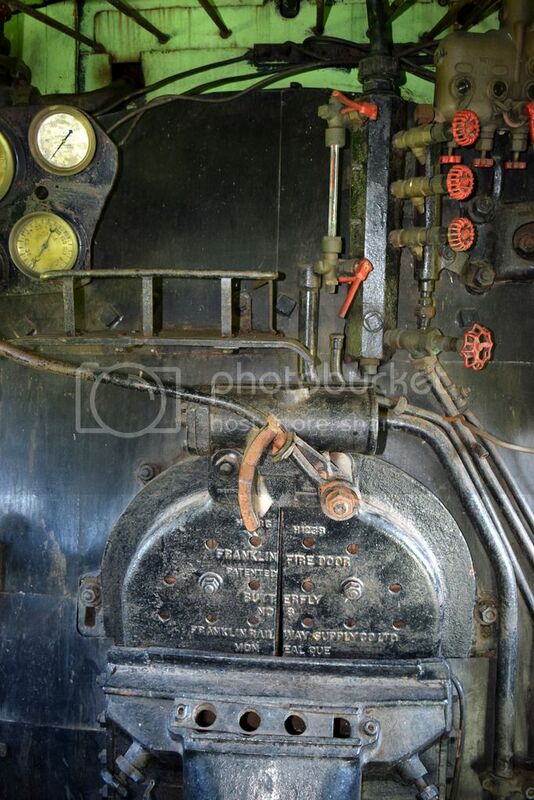 It was quite an experience to be in a vestibule with the top of a dutch door open, at night absorbing all this and occasionally being grit blasted by cinders. CN and the fan clubs at the time (UCRS in particular) deserve a lot of credit for making steam excursions available so long after regular CN steam operations in Southern Ontario had ended in 1959. Everybody: you can create a free account on Google, then in Google "Drive" you can create a folder that is public. Then you can put whatever you want in it, and distribute a link. Yes, from the first time I entered her cab a decade ago. She should have a three-feed Detroit Lubricator (For the air compressor, feed water pump and stoker engine). You have to understand that she is missing a number of parts, or had parts put on her that have nothing to do with that locomotive. Most of the gauges for example are unrelated to the engine, and I recall her having the wrong model of dynamo. Of course, I don't know how much of this was CN's doing, i.e. 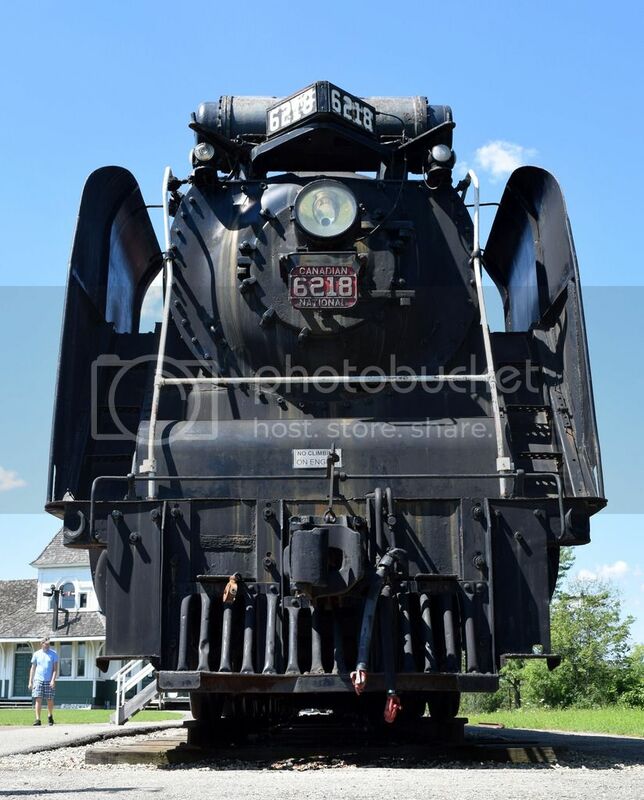 did they pick her parts for 6060 after retirement, or maybe when she was first overhauled in 1963 at Stratford, maybe that WAS the only lubricator and dynamo they had lying around. I haven't seen many cab photos during her excursion years so I can't give a definitive answer. 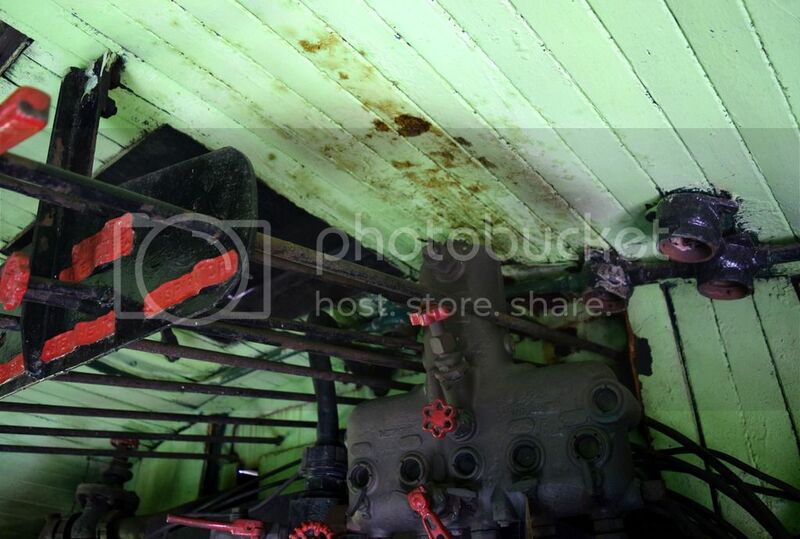 The people that were last responsible for taking care of her, have butchered her SO BADLY, that you can find anomalies such as one of the alemite fittings on the main rod pressed into the steam intake on the air compressor. They really had no clue what they were doing, and the engine is in far worse shape than if they had not touched her at all!!! I completely forgot about Google Drive. Spadina roundhouse ..... not John St. roundhouse. Guess that explains the line-up of CN diesels...taken minutes after and just a few feet way from where 6218 thundered past. Memory gets a bit vague after 50+ years....and I haven't lived there for a very long time. Wish I had taken more shots....but was always, and remain, a steam guy...and these were just "dirty diesels" . Looking back... have to admit that's a fascinating assortment of first gen. diesels...in both old and new paint schemes. I wonder if any of them still exist...? Great stories...I wonder if this was the baggage car you guys "rock and rolled" in. From memory, baggage car 9166 was used on all the trips out of Toronto that I can recall. It was probably specifically requested because it had 120 Volt power for tape recorders and remained in the latter steam era paint scheme for some time. For the first few years of excursion service, the coaches behind the baggage car were also taken from the commuter pool (4900's?) to match the consist. This became more difficult toward the end of 6218's excursion service. Spadina was an amazing place to visit. There always seemed to be fans there and photo releases were easily obtained. When I was 12 (1965) my mother had a friend that worked the John St. and he set up a visit. With us was the late Ted Audsley who later became the first master mechanic at the Halton County Radial Railway. Foreman George Armstrong gave us a brief tour and a younger assistant foreman took us for a ride up and down the turntable lead in MLW/Alco S-2, 8135, later preserved but unfortunately scrapped when the Harbourfront collection lost its site. At the time 6167 and 6218 were stabled, together although 6167 had last run in Sept. of 1964 and needed tubes. The estimate was about 10K at that time and some fans tried to raise funds (Ed Emery comes to mind) but that was a big chunk of change back then. Needless to say, after that visit, the bug hit me and I visited Spadina fairly often until it was demolished around 1985. It also had a huge impact on me getting into the mechanical side of rail although it ended up being on the electric traction side. Great shots, note the wrecker at the right of the last pic (rare visitor) and all the different power, SW-1200RS, FPA-4, MLW switchers. FM CPA and CPB 16-5's were also assigned to Spadina at this time and often used on the Hamilton commuters although some of them ended up in freight the following year and were scrapped shortly thereafter. If I recall correctly, the stack was sealed (with a welded plate) very close to the original donation time in 1973. 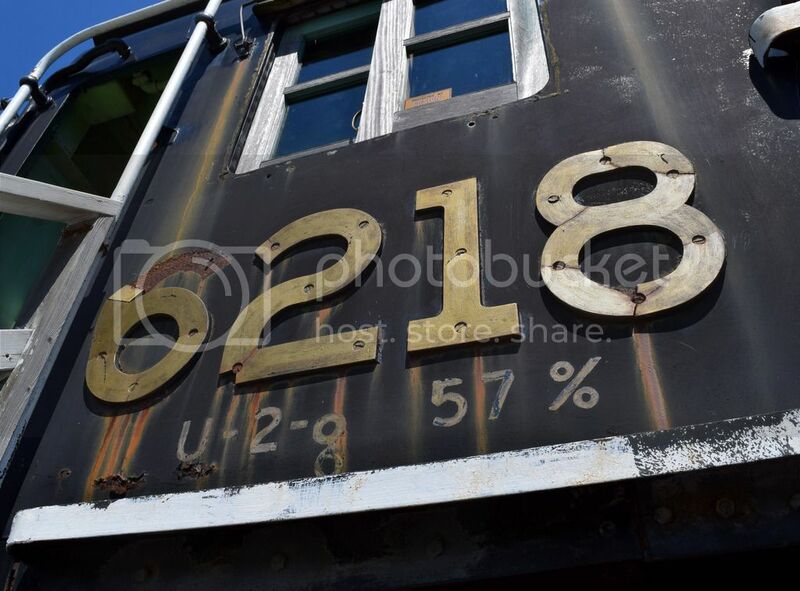 The 'smokebox' rust is, or was, mostly evident in a crudely welded repair plate, and an early step in a cosmetic restoration would be to cut that area out and flush-weld repair it correctly anyway, even for a primarily 'preservation'-oriented effort as iirc was planned in 2009. 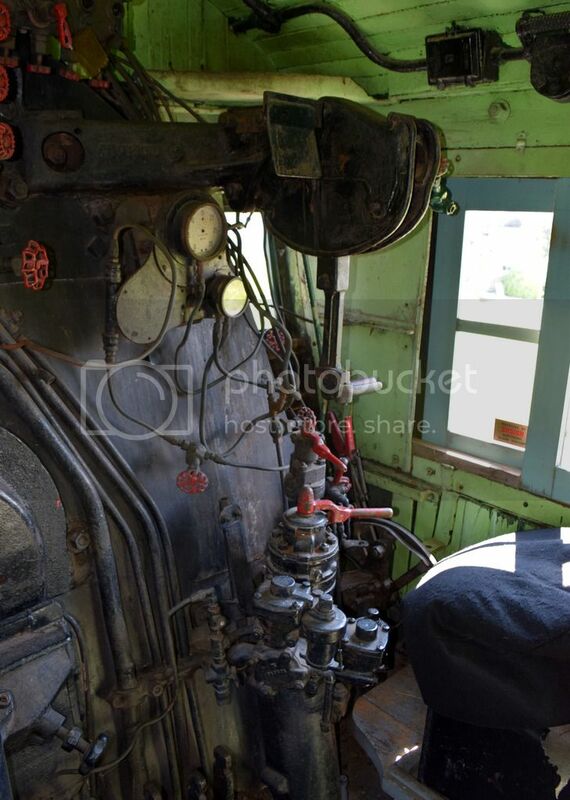 Not sure if the current plans still involve pure preservation; I'd still prioritize getting the crap out of the smokebox (and passivate what metal is left) and removing the improper lagging material whether or not the 'cleading is improved soon.